This event will focus on the attack on the Gaza-bound Freedom Flotilla in May 2010 and the ongoing, illegal blockade of Gaza. 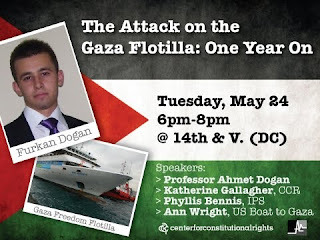 We will hear from Professor Ahmet Dogan, the father of Furkan Dogan, an 18-year-old American citizen killed during the brutal attack on the Gaza Freedom Flotilla, and from advocates who will discuss the current situation in Gaza and their efforts to get answers about U.S. knowledge of, and response to, the attack. We will also hear about the flotilla travelling to Gaza in June 2011, as an act of protest against the ongoing blockade and solidarity with the besieged citizens of Gaza. Ann Wright, former US Army colonel and retired U.S. State Department official who was a passenger on the May 2010 flotilla.